I so want one of these!!!! 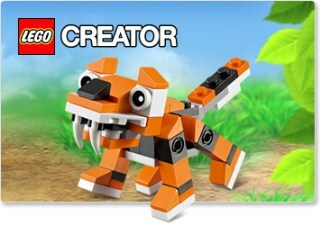 Your free LEGO® Creator Tiger will be automatically added to your shopping bag with orders of £25 or more. Available only through LEGO.com/shop and LEGO® Stores. *LEGO® Creator Tiger (30285) offer is valid for orders online at LEGO.com/shop, in LEGO Stores and LEGO® Catalogue telephone orders from 21st September to 6th October 2015, or while stocks last. Qualifying purchase must be equal to or greater than £25 in merchandise only. One LEGO® Creator Tiger (30285) per household. Cannot be applied to previous purchases or combined with any other discount, offer or free gift. It cannot be exchanged or substituted for any other item or cash value. It is not available for purchase. Offer is not valid at LEGOLAND Parks or LEGOLAND Discovery Centers. The LEGO Group reserves the right to cancel or modify this promotion at any time without prior advance notice.